Both tunnels owe their existence to Will Crooks, a working-class politician who chaired the London County Council bridges committee. In this role he campaigned for river crossings at both Greenwich and Woolwich to enable workers on the south bank to more easily cross the river. They worked in the thriving docks on the north bank. Ferries were frequently disrupted by fog on the river, dislocating dock work. Cllr Crooks was later to be elected as MP for Woolwich. It is claimed that the tunnels played an important role in bringing together labour groups from both banks of the river. Greenwich tunnel was the first to be built and opened in 1902 but never had an official opening ceremony. It replaced an old ferry service, the “horse ferry”, between Greenwich Pier and Island Gardens. The tunnel cost £127,000 with £30,000 being paid to London watermen as compensation for loss of earnings (sums which are worth about £15 and £3 million in today’s money). Lifts were installed in 1904, and replaced in 1994. Those lifts ran until 2010 when they in turn were replaced by the present lifts. Woolwich tunnel is newer and longer than its elder sister at Greenwich. The tunnel project was a response to a proposal by the North and South Woolwich Railway Co. to build a cross-river railway. The LCC opposed this and campaigned for a free pedestrian tunnel like that at Greenwich. 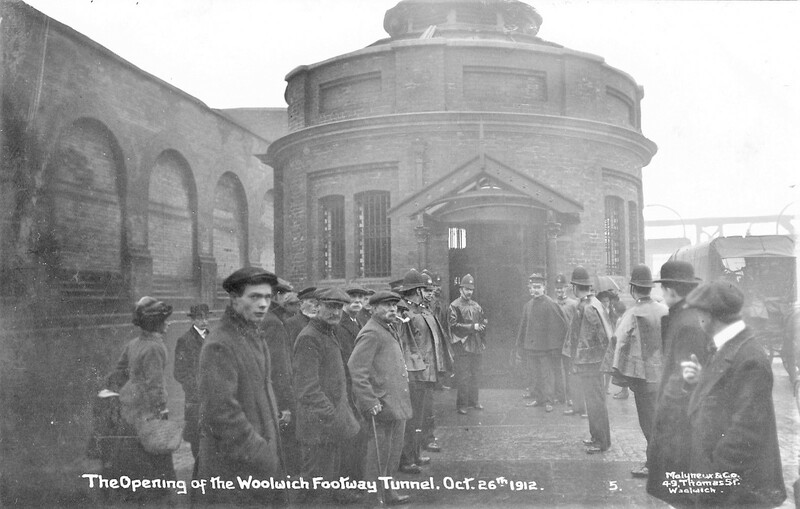 The tunnel was opened in on 26 October 1912 and is to a great extent modelled on the Greenwich tunnel. Both have redbrick entrances with glazed domes and cast-iron tunnels lined with white tiles, the Woolwich tiles by the Newellite Glass Tile Company . Lifts were installed in the Woolwich tunnel from its inception until they too were closed for replacement in 2009. The tunnel cost £79,000 plus £5,000 for the lifts. Both tunnels are inseparably associated with famous British engineers. Sir Alexander Binnie designed Greenwich and Sir Maurice Fitzmaurice Woolwich. It was this Victorian expertise in tunnelling, coupled with the political will to make life easier for east London workers that brought us these two unique Thames foot tunnel crossings. Today an estimated 1.5 million people a year use the crossings. Some are curious tourists; some are workers in the new north bank industries of finance and air transport that have replaced dock work. In 2008, as part of a wider Thames Gateway Project, a refurbishment scheme was agreed between the Department of Transport and the London Borough of Greenwich. Work began in 2009 but by April 2011, when the project ran out of time, it was far from finished. Further work concentrated on the Greenwich tunnel ahead of the 2012 reopening of the Cutty Sark and the London Summer Olympics. Meanwhile, oversight of the scheme was devolved to the Greater London Authority. A beautifully refurbished dome now caps the Greenwich tunnel, and its new lifts are very fine, though they still give occasional trouble. When this does happen the partly boarded in stairs barely cope with weekday traffic, let alone the great numbers that throng the tunnel on a fine weekend. There remains much cosmetic work to be finished. Woolwich tunnel has fared even worse than its more popular sister. Its lifts are not working, though at least the stairwells have not been boarded. The entrances on both banks remain clad in scaffolding. Surprisingly the Woolwich tunnel itself is rather cleaner than that at Greenwich. It is less well used but it is surprising how many do cross the river through it. In summer 2012 the now Royal Borough of Greenwich set up an inquiry into the tunnel refurbishment scheme, admitting that it was a long way from completion. And in February and April 2013 the Greater London Authority admitted that it had the responsibility to help steer the works to a successful conclusion.